Fantastic side dish, it never lets me down, people are always asking for this recipe after eating it. I have found it goes well with barbecued food as well as Mexican food, you can also serve it with cold meats and salad, it will freeze but is best straight from the oven when then cheese is still warm. It does really need fresh coriander so do not try getting away with dried it just does not work. Heat oven to 375°F (190°C). Heat oil in pan over medium heat until hot. Add rice; cook, stirring constantly, until rice turns opaque white, about 2 minutes. Quickly add white onion; sauté over medium heat 1 minute. Add chillies, spring onions, garlic, salt and cumin; sauté 20 seconds. Add stock; mix well. Heat over high heat to boiling; reduce heat to low. Simmer, covered, until rice is almost tender, about 15 minutes. Remove pan from heat. Add 1 cup (250 mL) cheese and the chopped coriander; toss lightly to mix. Transfer to greased (1.5-L) baking dish; top with remaining cheese. 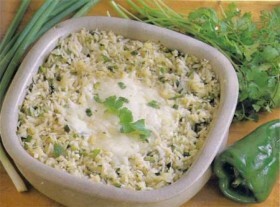 Bake, uncovered, until rice is tender and cheese topping is melted, about 15 minutes. Garnish with coriander sprig.